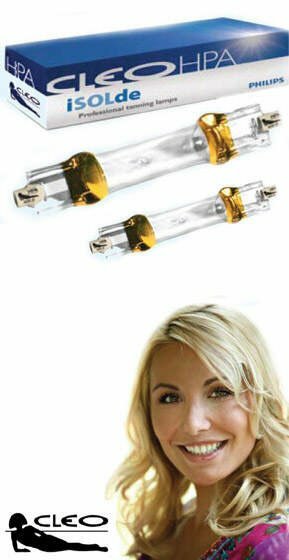 Technilamp offers replacement bulbs and UV lights for sunbeds and tanning beds. Our range of tanning bed replacement bulbs and UV lamps offer high efficiency and a stable output. The development of our lamps is based on scientific knowledge about the healthy effect of UV-irradiance on human beings. Customer confidence and the safe operation are guaranteed due to the use of state of the art technologies. Cleo tanning lamps are characterised by their high efficiency as well as the stable output of every single lamp over the whole lifespan. The results are highly reliable and deliver a compelling tanning effect. The Cleo by iSOLde low-pressure range is classified in six separate sections whilst complete product lines featuring all popular performances. Cleo Advantage, Cleo Swift, and Cleo Professional-S provide very efficient, immediate and long-lasting pigmentation. A beautiful dark complexion can be obtained due to the high UV output. These lamps are particularly designed for short tanning sessions. Cleo Swift feature noticeable higher UVA-output for immediate deep skin darkening. Cleo professional lamps are marked by their well-balanced UVA UVB ratio. They afford excellent bio-positive parameters and therefore are ideally suitable for health care. (Vitamin D3 synthesis, compensation of sunlight deficiency). Cleo Performance and Cleo Performance-S helps to achieve instant and gentle tanning effect. The lamps are ideal for people who enjoy extended tanning sessions. They also give a long lasting tan to sensitive skin. Cleo Compact and Cleo Compact-S are the product lines comprising short while extremely powerful tanning lamps. They are particularly designed for low-pressure facial tanners. Cleo Emotions Active Red are tanning lamps emitting energising red. They boost the metabolism and provide a deep tan. The Cleo by iSOLde high pressure range comprises lamps of high output and first class performance. The Gold coating on either end guarantees ideal operating temperature within very short period. HPA High Pressure Lamps are designed for use with Cleo and Body tone low pressure lamps. The range covers nearly the complete spectrum of performances and socket types affording high flexibility and attractive choice: All Cleo HPA high pressure lamps feature a life span of 800 hours.